ULTRA HIGH POWER ONE-PIECE PA SYSTEM/POWERED MONITOR. The Powered Hot Spot Monitor is a product like no other. 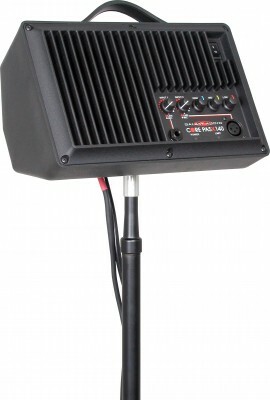 The Powered Hot Spot delivers an ear-shattering 100 watts of power! The Powered Hot Spot, like the original Hot Spot, delivers high power, in a small, portable, lightweight design, about the size of a shoe box. The Powered Hot Spot contains one of Galaxy Audio's NEOLITE Neodymium driver. 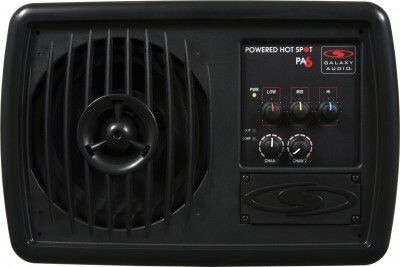 Inside the Powered Hot Spot is a power amp that can deliver 100 watts continuously @ 8 ohms, 150 watts @ 4 ohms. 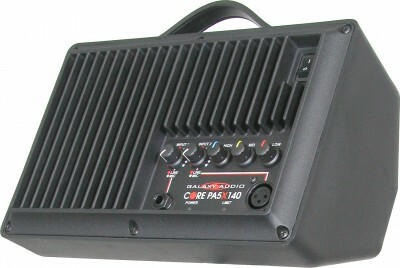 The Class H power supply configuration utilizes four output transistors, a low voltage pair, and a high voltage pair. Its low voltage transistors are active with any signal. When demand on the amp exceeds the low voltage transistors' capabilities, the high voltage transistors kick in and provide additional power. The result is an amplifier that runs cooler, weighs less, is smaller and more efficient. The Powered Hot Spot contains two inputs, a ¼” and an XLR, each with its own volume control. 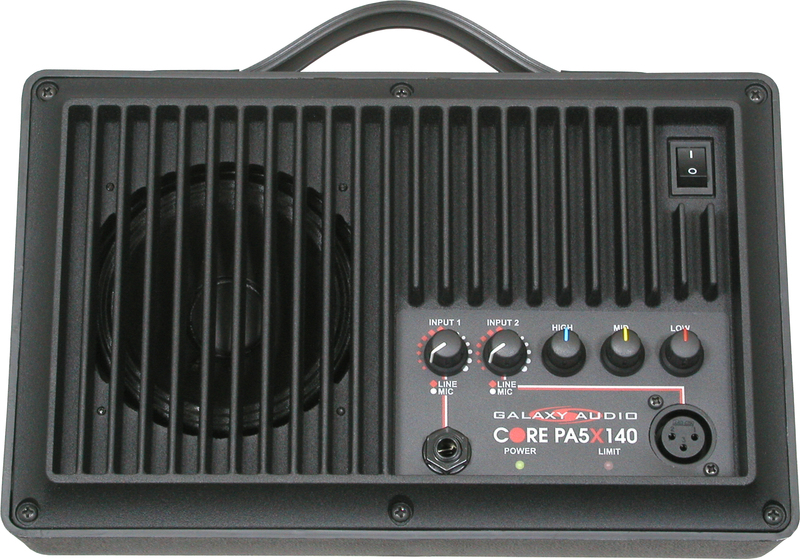 Both inputs feature the ability to accept microphone or line level input, which maximizes the signal-to-noise ratio of virtually any input source. Best of all, you don't have to flip a switch to distinguish between microphone or line level, the Powered Hot Spot automatically adjusts itself with our SmartALIC circuitry. Also, the Powered Hot Spot features a 3-band equalizer to allow you to adjust the equalization for optimum sound. As well as the built-in compressor/limiter circuitry controls the amplifier gain, acting like a compressor on transient signal and a “brick wall” limiter on signals that continuously exceed a predetermined limit. This results in an apparent 6 dB increase in SPL without distortion. That's twice the sound pressure! 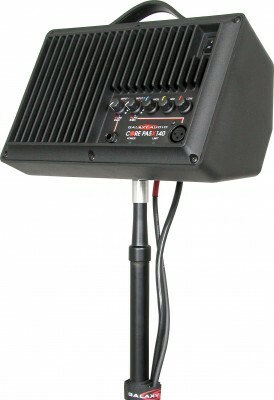 The Powered Hot Spot produces a maximum SPL of 114dB. That's more sound pressure level than most sound systems twice its size! The Powered Hot Spot is constructed of a black fire-retardant styrene with a black cast aluminum faceplate/grille, which is attractive and acts as a heat dissipation device. With the Powered Hot Spot containing the lightweight NEOLITE Neodymium driver and a 150-watt power amplifier, it is truly “POUND FOR POUND THE WORLD'S MOST POWERFULL SOUND SYSTEM”! Short circuit current limiting. Short circuit foldback limiting. Thermal short circuit protection. Dynamic load line cooling. Turn on/turn off transient suppression. 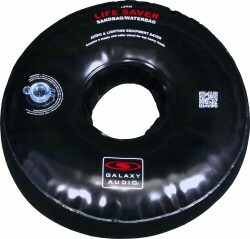 One Galaxy Audio S5N-8 ferro fluid cooled 5” NEOLITE Neodymium driver.